Let’s start with scalping. You set the mower to the lowest setting and bag all the clipping. You’ll need to invest in a good respirator or dust mask too because this can be a very messy process. On the positive side, it removes a lot of last year’s dead grass and also a lot of the weeds. It allows the soil to warm up fast which will make the lawn green up sooner which in turn allows you to start mowing sooner. Not only does lawn scalping promote growth, but it also thwarts diseases. 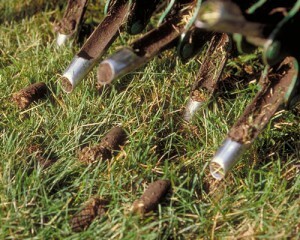 Scalping your lawn eliminates a layer of thatch and thatch holds moisture. This entry was posted on Tuesday, March 10th, 2015 at 9:39 am	and is filed under News & Updates. You can follow any responses to this entry through the RSS 2.0 feed. Both comments and pings are currently closed.